A routing slip can come in different forms. 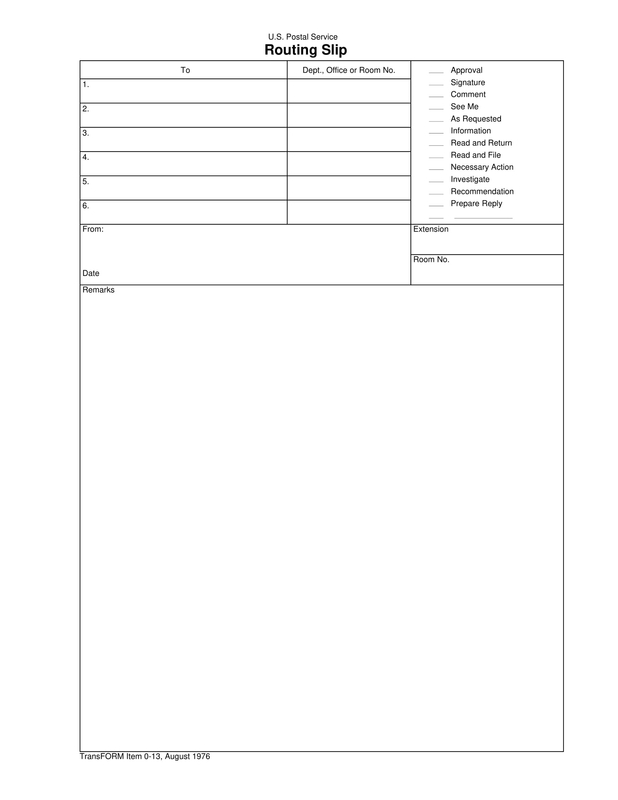 It can be a formal business document or it can also be just a slip template or a piece of paper. The main purpose of using a routing slip is to ensure that there is specification when it comes to the route and/or direction in which an information or a document must circulate. There are a variety of ways on how routing slips can be beneficial which greatly depend on how it is used and the processes that can be affected by the slip’s content. Since there are various routing slips that can be useful to your operations or activities, we have listed several kinds and types of routing slip templates and examples that you can refer to if you want to begin the development of your own routing slip document. Is a Routing Slip a Necessary Document for Business Operations? A routing slip can help you resolve issues when it comes to workflow organization and awareness. Since a routing slip will be given to different point persons and departments, people can be more aware of what has already been done or those that are still needed to be looked into and executed to finish a particular transaction. Hence, a routing slip can give the signal on when to do processes in a timely manner or how to use a given information accordingly. 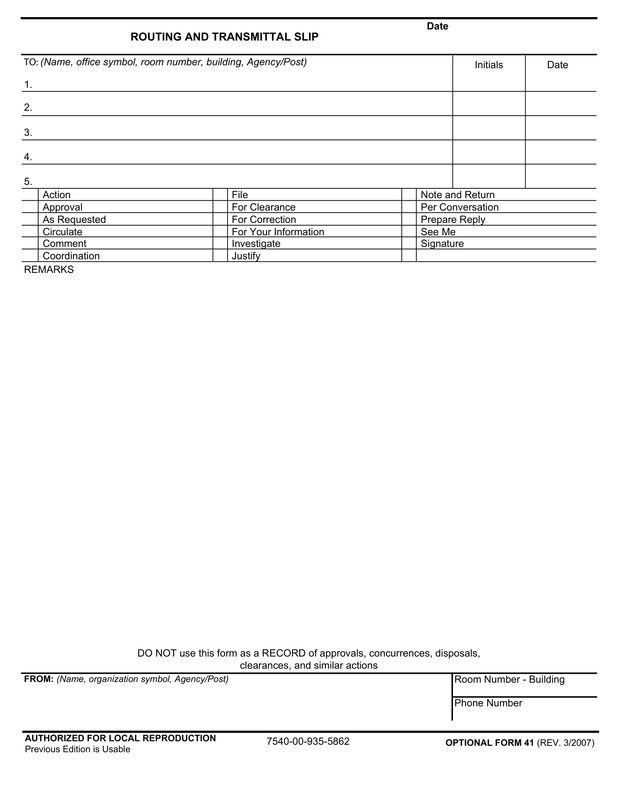 A routing slip can ensure that all entities who are responsible for the implementation of particular action plans are knowledgeable of the deliverable that they are expected to provide. 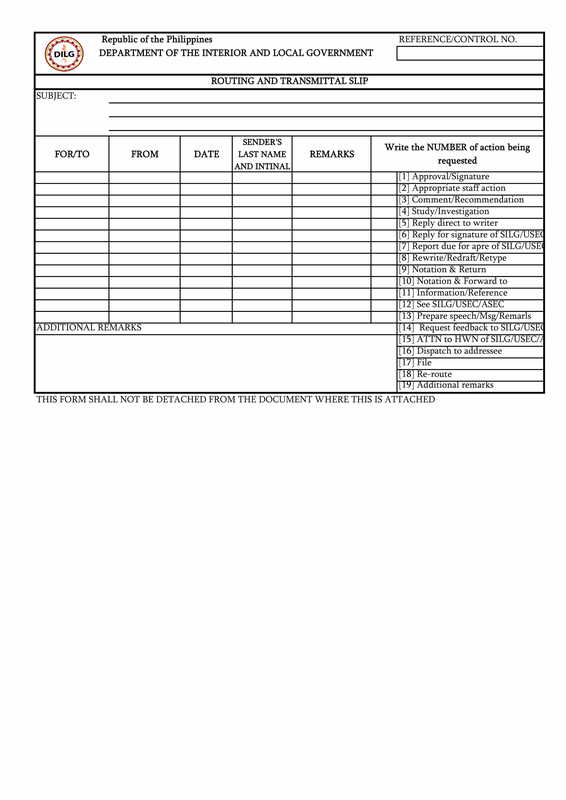 Aside from the minutes of the meeting or the task lists created in every department, a routing slip can also be used as a reference by the business and its stakeholders whenever there is a need to review particular call-to-actions. 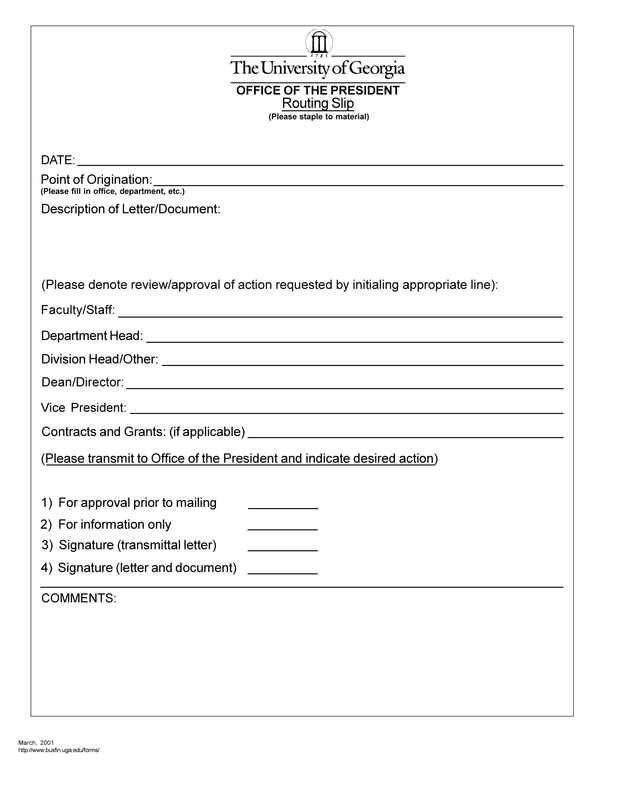 A signed routing slip only means that the entity who is supposed to receive it has already been given the information that he or she needs to execute an activity. A routing slip can present a platform where proper and formal communication can be made between the stakeholders of the business or any entity involved in a process where the routing slip is used. If there are information in the routing slip that are needed to be addressed, it will be easier for entities to contact one another since they are aware of the people to whom the routing slip will also be given. This can make it easier and faster for errors or any misleading information to be addressed. 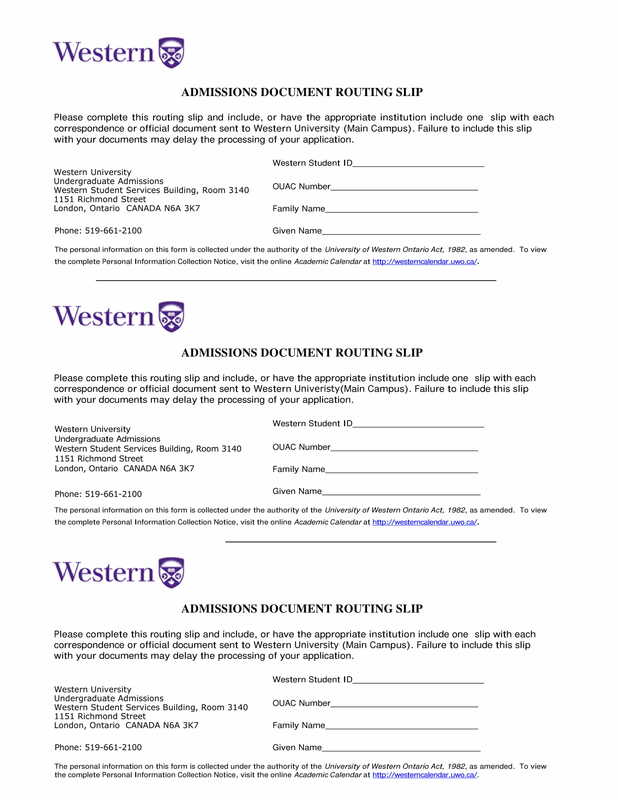 A routing slip can promote the development of protocols that can make business processes and activities more effective. There are businesses who conduct a meeting for an activity first before creating a routing slip. 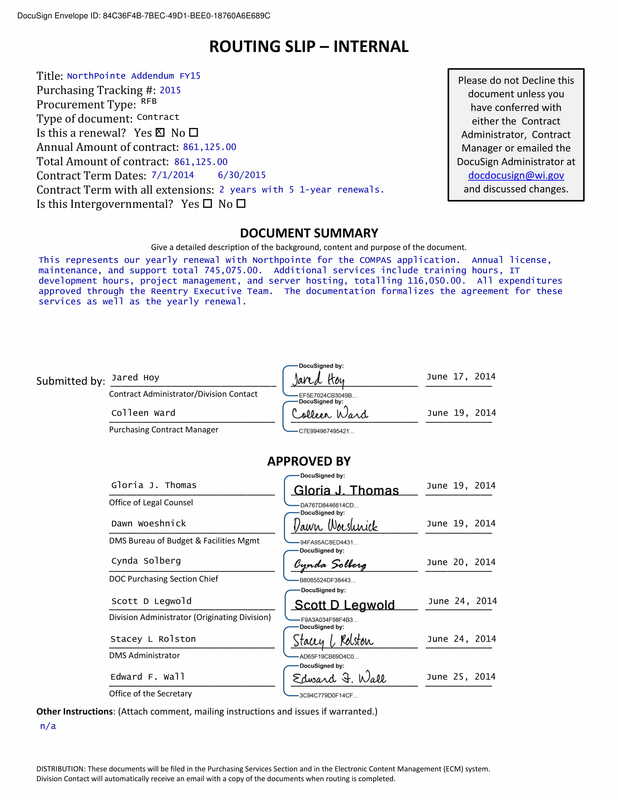 There are also some that allow each department to have their own routing slips and use these documents whenever they would like other divisions or areas of the business to be aware of particular processes where their involvement is necessary. Since every organization has different ways on how to use a routing slip efficiently, each of them can develop guidelines and protocols that will allow the proper transfer of information from one department to another. In comparison to a salary slip, a routing slip should also be arranged in a particular manner in which information can be clearly seen, identified, and understood. The layout of a routing slip is as important as its content, which is why it is recommended for you to take your time when developing the document and when evaluating the final draft that you came up with. A basic procedure that you can follow if you want to create your own routing slip is discussed below. First, be aware of the purpose of the routing slip. You have to develop a routing slip template that you can use every time you need to send or disseminate information to a number of entities within the business or the organization. Knowing the reason why you need the routing slip or the process where the discussion in the document is essential can help you be specific in listing down all the information that is essential to be known by the other parties that you would like to transact with or talk to. Have a draft that can give you an idea on how all the details that you need to include in the document will be put together and formatted. 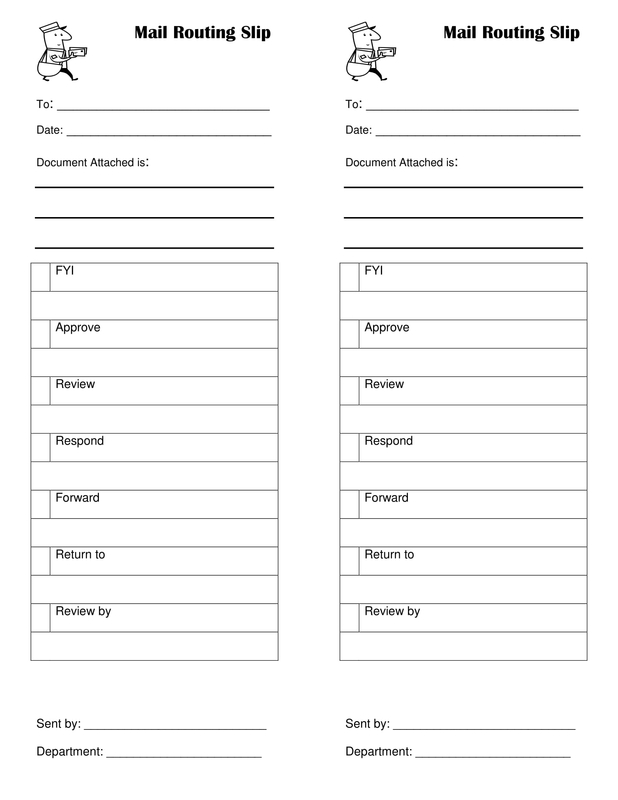 Again, using a routing slip template especially for the same business processes can help entities become more familiar with how the routing slip is supposed to be looked at and used. Moreover, an organized routing slip can lessen the chances of misunderstandings due to misleading information or content placement. Once you already know how to format the document and its content, be specific with the presentation of the actual routing slip. Decide whether to use the letterhead of the business together with a subject line or to just specify a generic title for the routing slip. 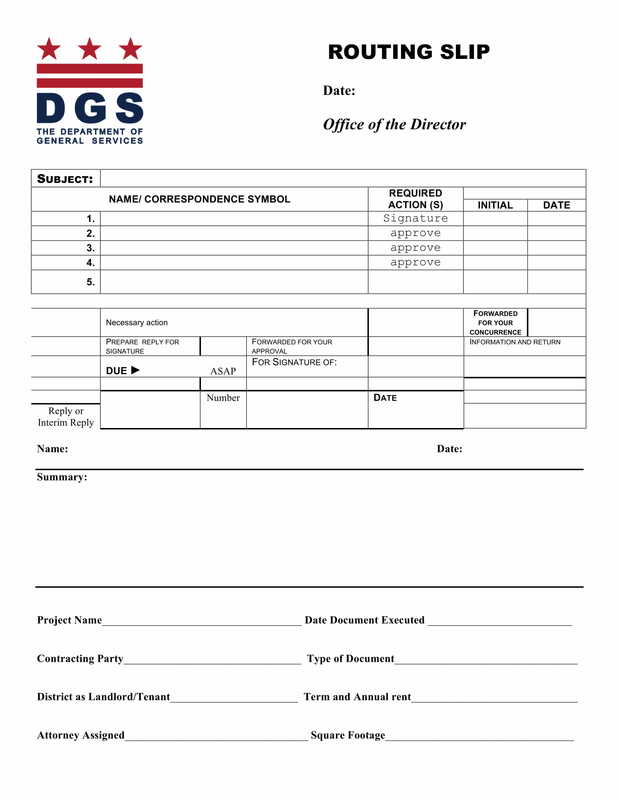 This can help you label the document so that the entities who will receive it can easily identify what kind of document it is that they are receiving. State the date when you made and released the routing slip. This is very important especially if the content of the document is time-sensitive. 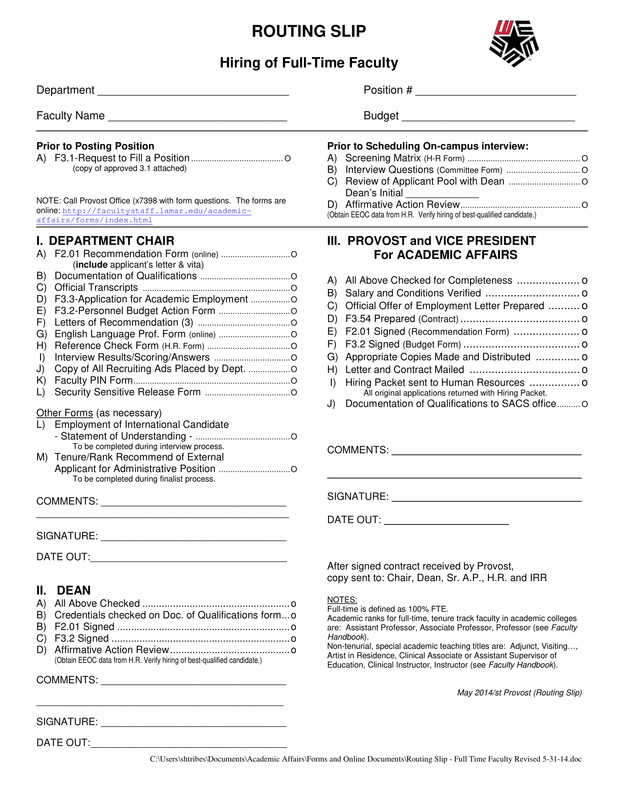 It will also be best if you will include a space where the receivers of the document can affix their signatures and the date when they received it. Doing this can help you protect yourself from falsified claims should internal issues arise about the routing slip’s usage. Specify all the attachments that are included when the routing slip has been delivered. There are activities where there is a need for additional documents to be routed together with the routing slip. An example of this is when a routing slip is used in the hotel and resort events industry. Aside from the routing slip, it is essential for a banquet event order to also be given to particular point persons of every hotel and resort departments so that they can be aware of the things that they need to provide for a particular event or account. The body of the routing slip will depend on the nature of your operations. What is essential is for you to ensure that your discussion will be specific, direct to the point, and concise so that the details that you will disseminate can provide clarity to all entities involved. Present a call-to-action. Do you need the receiver’s approval for a particular process to push through? Would you like the receiver to review the document or forward it to its subordinates? You have to provide an instruction on how the receiver of the routing slip should make use of the documents or the information given to him or her. For a company that incorporates a routing slip in a particular transaction on a daily basis, this may not be necessary unless there is an additional instruction or any changes in the regular operations that the routing slip receiver must know. Add any other information that you would like to include in the routing slip that you think can help you fully maximize the document’s usage. Lastly, create a space at the bottom of the document where the name of the person who delivered the routing slip to different departments can be specified. You can also put it at the end of every receiver’s signature. From the hospitality industry to the fields of medicine and academics, there are different entities who can make use of a routing slip to better their operations and communication lines. The usage of a routing slip can help interlink internal entities further, which is a good way to ensure that there is a collaborative effort toward achieving the goal and objective of the business or any parts and areas of it. 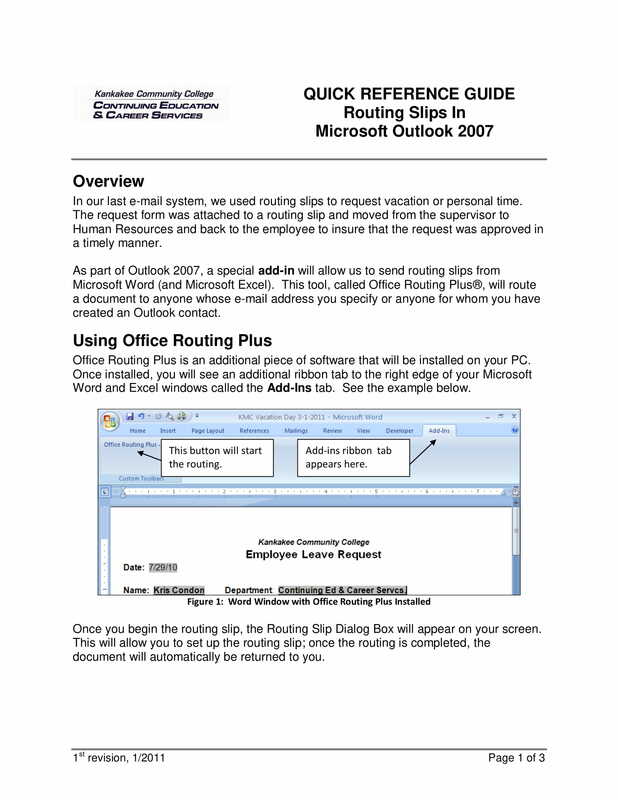 Some of the tips that can help you create a great routing slip are listed below. Just like when making a permission slip, it is of utmost importance for you to specify all the entities concerned and involved in the usage of the routing slip and the implementation of its content. In this manner, you can ensure that the flow of information dissemination is effective and has been done in a timely manner. Make the routing slip as simple and basic as possible. Do not include a lot of unnecessary details and information especially if your purpose is just to make the document aesthetically pleasing. As long as the routing slip is presentable, well-formatted, and detailed, then there is no need to include characters and other items that can only make the routing slip look cluttered and poorly put together. Align the content of the routing slip with the processes executed within business operations. You have to ensure the routing slip will complement the communication lines of the business as well as the flow in which corporate practices and activities are implemented. Review the content of the routing slip before sending it to all intended receivers. Moreover, you have to be specific with the departments or even the point persons that you would like the routing slip to be delivered to. It is not always necessary to send routing slips to all business departments unless each of them has a contribution to the processes, programs, activities, or projects where the routing slip is used as a relevant organizational tool. Ready to Draft Your Own Routing Slip? Use references like downloadable examples, document templates, and existing or previous routing slips. Make the routing slip easy to understand by using a layout that is understandable, well-planned, and properly executed. Ensure that the routing slip content is complete and updated. If you want to create a routing slip for your business, you have to be aware of the things that you need to consider before and while using the document. Try to make your business’s routing slip draft now with the help of the downloadable examples in this post. It will be a great help if you will also review the information that we have specified above.